He was discharged unfit on 15th February 1918 and died at home on the 18th December 1918. William Thomas Edwards was recorded on the 1901 census, living with his family at Rhyd y Ceirw in Tryddyn. 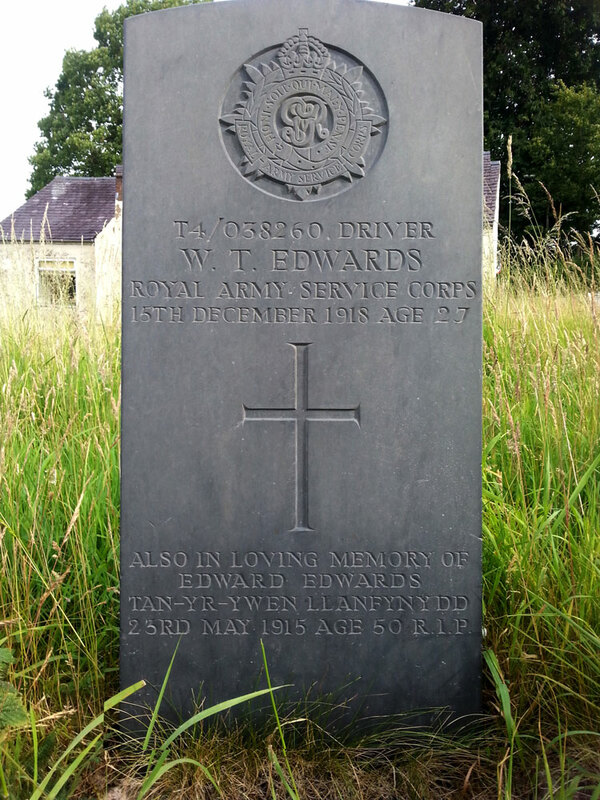 Head of the household was Edward Edwards a 35 year old farmer (an employer) who had been born in Tryddyn. His wife Mary was 34. Their listed children were Edward 12, William T 10, John H 6, George 5 and David 2. The next census of 1911 finds the family at Mount Farm Ffrith. Head of the household, Edward Edwards was 48 and was this time, an an employed worker- a Labourer. His wife of 23 years Mary was 47. She had given birth to 9 children all of whom had survived. Those listed were Edward Edwards 21 and John Hugh 18 who were both Labourers. William Thomas 20, was a Collier. The rest were George 15, David 11, Samuel 8, Robert 7, Margaret Ellen 4 and Mary Elizabeth 1. William Thomas Edwards’s Service Records have survived and are accessible on www.ancestry.co.uk They tell us that he signed up and Attested on the 5th January 1915 in Wrexham. His address was given as Tanyrowan Llanfynydd. His age was 24 years and 1 month, he was unmarried and was a Collier. He was 5 feet 6 and a half inches tall, had a chest measurement of 36 inches with an expansion range of 2 inches. He had a ‘coal scar’ on the right of his chin. His religion was Independent (Chapel) and his next of kin was his father Edward Edwards of Tanyrowen Llanfynydd. He became Driver T4/038260 in the Army Service Corps. His records show that his army career began on 5th January 1915 to the 22nd March 1915 ‘at home’ (in the UK). He entered his first theatre of war (France) on the 23rd March 1915 and served there until the 8th March 1917. He became ill in January 1917. He received treatment in Rouen Hospital and later at Manchester and Lancashire Hospital where he was treated for bronchitis. He was admitted to the Mater Hospital in Belfast on 26th December 1917 where the TB was found in his sputum. He was then sent to the Military Hospital Belfast on 9th January 1918. His discharge papers were prepared there. His total service was 2 years and 42 days. There is an index card for William Thomas Edwards in the Flintshire Roll of Honour in The County Record office in Hawarden. The address on the card says Tan y Rowen Llanfynydd and his regimental details were confirmed as above. The card says he “Died 15th December 1918 from the effects of Gas”. The army does not identify exposure to gas in its medical records.